Silver birch gathered ruffles - a nice combination of words, wouldn't you say. But in reality, it's an even nicer fusion of fabulous design skills and some serious construction craftsmanship: its thick 270 GSM inner fill, coupled with an ash-grey base with ruffle accents in a diamond pattern, make this one a tried and true classic just waiting to slapped onto your love nest. I recently bought this comforter and was so happy when it came in. It's incredibly soft, looks exactly like the picture, and I'd say the color is just a bit duller than the pictures. I get hot very easily, so for me this comforter was a bit heavy, but not unbearable. The downside is the quality. I've had it on my bed for a couple days without putting it in the washer, and the seams are already starting to come undone. This is making the ruffles lose their shape and become flattened. Sadly, I will be returning this comforter because of the low quality. The color seems to have a green tint to it, and it is very thin for the price. This is a beautiful comforter. We have a very masculine queen bed set (dark brown) and this adds a beautiful feminine element, yet very chic. It is extremely well made, and will last a long time, I suppose. We ordered the King size for the extra coverage and it is perfect. Highly recommended! 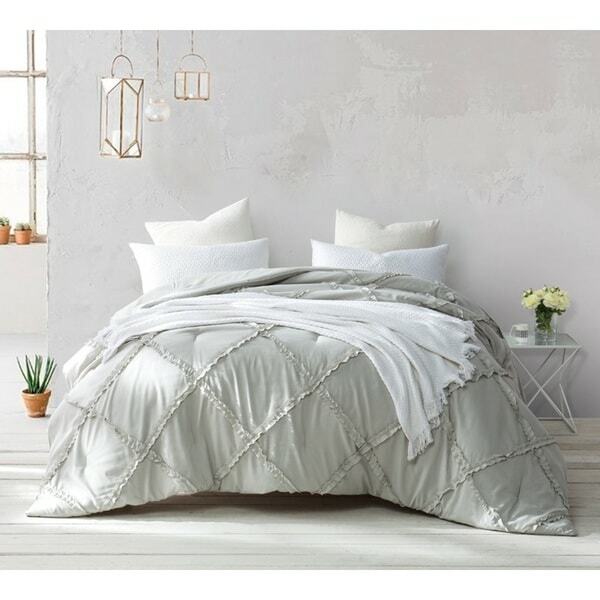 Love this comforter. Light weight yet warm and cozy. King fits perfectly on our new sleep number bed. Exactly what I wanted. Nothing too thick. This comforter is even prettier in person. It's so soft and light. Very shabby chic!! Love my new comforter. Color and size just as stated & pictured. Good buy!!! The material doesn't look very rich but it's very pretty, I don't see a green tint to it like the other review, looks pretty silver/grey to me. It looks lovely on my daughter's dorm bed. Ordered the Silver, came looking like a washed out tan. Not a flattering color. This comforter was so beautiful. I used it in a guest room on a design job and it was a huge hit. So luxurious and soft. Color was a soft gray as shown. Would definitely order again. "Can you purchase matching queen pillow shams? I thought I bough a set, but I just purchased the comforter." Unfortunately, there are no matching shams for this comforter. "Will this bedding be available in a twin or twin XL? Shopping for college student. " This is not currently available in a twin or twin XL size option. "Will this be available again in Queen size? If so, when will it be back in stock?" The BYB Silver Birch Gathered Ruffles Handcrafted Series Comforter in the size Queen should be back in stock by June. "Is the silver birch gathered ruffles comforter available in king size?" Unfortunately, this item is not currently available in King. fusion of fabulous design skills and some serious construction craftsmanship: its thick 270 GSM inner fill, coupled with an ash-grey base with ruffle accents in a diamond pattern, make this one a tried and true classic just waiting to slapped onto your love nest.